HOBO Temp/RH Dataloggers - These low cost, inconspicuous dataloggers measure temperature & humidity in a range of different models. All use HOBOWare software for easy data download and graphing using a standard USB cable (supplied with software). For sites with multiple loggers, use the HOBO Shuttle to download multiple loggers without carrying a laptop around, or having to remove the loggers to take to a PC. Elsec UV/Lux/Temp/RH Meters - These meters have been designed specifically for archive and museum requirements. 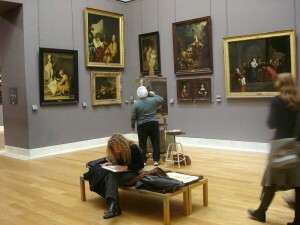 Thermohygrographs, or chart recorders have long been used to monitor temperature & humidity in museums and art galleries. They are familiar with many users and provide an instant graphical view of conditions. However you can now buy many dataloggers for the same price as one new thermohygraph. This is often a good solution, allowing you to keep a permanent record on computer and the ability to output different graphs or tabular reports for different users. For those applications still requiring a thermohygrogaph we are able to provide pricing for the SK Sato Sigma II model, as well as charts and pens. If your existing model requires servicing, we do have the facilities to check the calibration. However, be aware that this can be a time consuming and expensive process and so we recommend that you call us about options.